If there's a festival going on somewhere it must still be Summer, right? So be happy: we bring you glad tidings of the forthcoming inaugural Peckham and Nunhead Free Film Festival, which is taking place all over SE15 during the next seven days, much of it outside... A whole week of free stuff: workshops and screenings and tours and debates - with nary a box office queue or cinema usher in sight. See, the events are mostly happening in the area's lost nooks and crannies, its less obvious venues, and, in some cases, up its back passages. 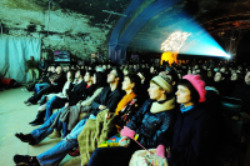 Proceedings kick off on Monday with a walking tour of Peckham's lost cinemas - short films (not telling you what: think Secret Cinema and all that) are to be broadcast on to the sides of buildings using a bicycle-powered projector (oh, we like this idea). Another thing we've inked in from the Peckham programme is the screening of Nosferatu at Frank's Bar on the evening of Sunday 12th. Nunhead highlights include a shiver-down-yer-spine evening showing of the old David Niven classic A Matter of Life and Death at Nunhead Cemetery on Friday 10th. There's also an impressive range of stuff happening at the Old Nun's Head. So pack a cardi or pully and a bottle of pop and get booking. Image by Joe Lee via the Londonist flickr pool.